Lanvin‘s fall combination of the floppy hat, cape, and loafer is my fall jam. It’s so… mysterious. I have the black floppy hat; and I have the loafers. The cape eludes me. I say, “To Cape or Not to Cape?” because they have their pros and cons. Pros: Instant chicness. Hides your food baby. Eliminates need to decide on a top. You’re basically a fashion superhero. Cons: Cannot wear a bag crossbody (I’ve done it. Such a fail.) You may look pregnant. Exposed arms in the cold, therefore you will need to plan a top accordingly. Might experience difficulty reaching objects on high shelves. Loft and J. Crew have eerily similar capes. 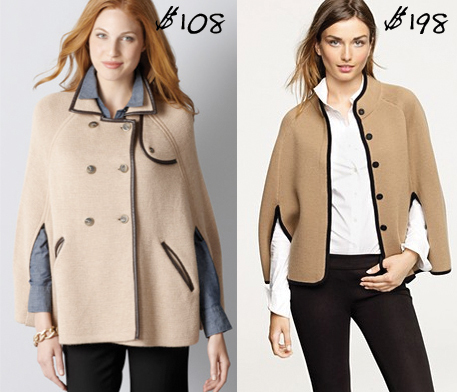 Both are camel colored with darker trim, but one is $90 cheaper. 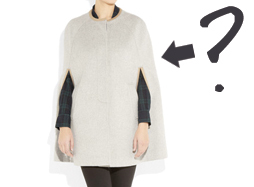 If you’re looking to add a cape to your wardrobe, I recommend looking at Loft. Can you think of any other cape cons? It’s a fun game.